Discussion in 'Windows, Linux & Others on the Mac' started by proZak, Apr 7, 2007. I'm having trouble getting Boot Camp to partition my Hard drive for windows. Every time I hit partition (I usually set the Windows partition between 20-32gigs) it begins to partition, but then it displays this window. If anybody could tell me the problem, I'd appreciate it. Repair permissions and reboot. I had that come up and it fixed it. Hope it works for you. Tried that. Didn't work. :/ Got the same message. Did you run Disk Utility from the install disc that came with your mac? 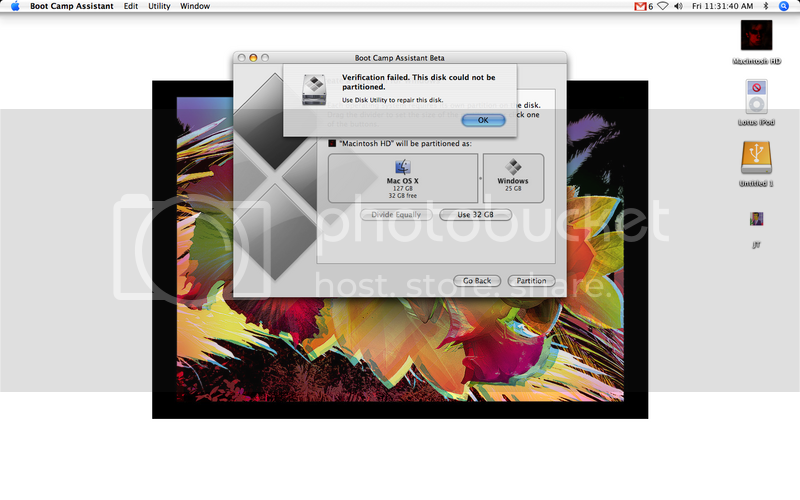 I had that error as well and I had to repair the disk volume from the install disc's Disk Utility.